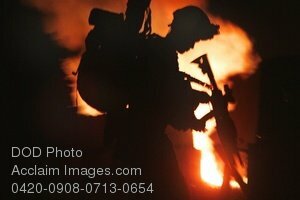 Description: Free, public domain image: Soldier Loading His Rifle, Silhouetted Against Flames. A U.S. Marine with 2nd Battalion, 8th Marine Regiment loads his M-4 service rifle before leaving Patrol Base Hasaan Abad in the Helmand Province of Afghanistan, July 1, 2009. The Marines presence prevents freedom of movement for the enemies of Afghanistan, returning peace and prosperity to the local populace. The Marines are part of the ground combat element of Regiment Combat Team 3, 2nd Marine Expeditionary Brigade. (U.S. Marine Corps photo by Sgt. Pete Thibodeau.